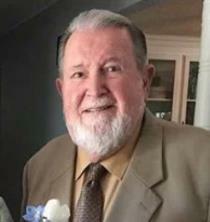 Edward Eugene “Gene” Nicholson, 84, of Cleveland, passed away peacefully on Thursday, November 8, 2018. Gene graduated from Somerset High School in Somerset, Pennsylvania, class of 1951 then went on to Northwest Bible College in Minot, North Dakota. He completed a bachelor's degree at Southwestern Assemblies of God College in Waxahachie, Texas. Over the course of his 62 year ministry, he performed 177 funerals and 181 weddings. He pastored seven churches throughout New York, Pennsylvania, Missouri, and Kansas. He was an avid baseball fan and coin collector who never met a stranger and loved sharing insights into these two passions. He was gifted in thoughtfulness and never failed to send his family and friends birthday and anniversary cards. He also demonstrated kindness to the various local businesses he visited and the people he met throughout the years by bringing them peanut butter fudge. He was admired by all who were privileged to meet him and his compassion was tangible. Gene was preceded in death by his father, Irvin Clayton Nicholson, by his mother, Helen Irene Grace, and by his sister Shirley Pearl Nicholson. Survivors include his wife of 61 years, Martha Lee Nicholson; his sons, Timothy Nicholson (Connie), Todd Nicholson (Stephanie); his daughter, Renee Brown (Eddie); his grandchildren: Amie Nicholson, Kyle Cox, David Nicholson, Mistori Nicholson, Hailey Nicholson, Bailey Nicholson, Melia Nicholson, Ryan Richardson (Heather), Rhonda Graham (Keith), Cassie Brown, Benjamin Nicholson, Tessalyn Nicholson, Kate Nicholson; and his great-grand children: Nicholas Staggs, Robert Tucker, Kyla Richardson, Connor Richardson, Kelsie Richardson, Jude Graham, and Scott Graham, and other family members and friends. A Remembrance of Life service will be held at 2 p.m. on Saturday at North Cleveland Church of God Dixon Chapel with Pastor Mark Williams officiating. The committal service will follow at Lee Cemetery in McDonald, Tn. The family will receive friends on Saturday, from 12-2 p.m. at the church. In lieu of flowers, the family asks that donations be made to the Rise Up and Build program at North Cleveland Church of God. The Ocoee St. Chapel of Jim Rush Funeral and Cremation Services has charge of the arrangments.